We may have got used to black tea here in the UK but modern times mean we can enjoy the freshest of teas not possible when the Dutch first bought them to us in the seventeenth century. So, if we take ‘normal’ teabags out of our minds for a second and remember that tea comes from a plant, it’s not so surprising that tea could be green in colour. That’s right, green tea isn’t tea from the planet Krypton, it’s just the tea plant which has undergone minimal oxidation during processing! That doesn’t mean green tea doesn’t have some superhuman qualities though. It’s become popular for its well-studied health benefits, from speeding up your metabolism to its high antioxidant levels, useful in preventing some cancers. The health properties are a great motivator for trying green tea and I’m sure sales will boost on January 1st, but what happens next? We either become converted and become green tea addicts, or have a bad cup and conclude that it’s not for us as we’re not ‘health freak’ enough - willing to go to any lengths for a superhuman body. We just want a nice cup of tea. I’ve tried various green teas and know enough to say that it can bring you refreshing aromas, worth drinking purely for this reason and not just for some weight-loss chore. I’m going to look at China green tea today, because it’s the birthplace of tea… conjuring up images of an exotic history of teahouses, teapots and Taoist monks meditating amongst beautiful countryside… getting carried away..? China didn’t have the tea ceremony like Japan, but served in homes it’s a mark of friendship and hospitality, a trait we’re familiar with. So if we want to turn our tastebuds to what green tea really has to offer, we had better look at the exceptional ‘JING’ teas who source their tea producers first hand. They’re a fairly young company but so well regarded you’ll likely be drinking their teas if you’re in a 5* hotel such as Pennyhill Park Hotel and Spa. To start, i’m looking at the Organic ‘Jade Sword’ green tea plucked in the Spring months of May at Fengwukou village garden in the Zheijian region. To prepare, stick on the kettle (with filtered water if available) until just before boiling so the water’s around 80c. Being loose tea you have control over the strength of the tea, so heat the teapot first and then infuse the tea for around 3 minutes. To avoid steeping too far, take out the tea strainer or pour into a separate teapot. Not just a cool name, you can smell the grassy and floral aroma coming off the Jade Sword straight away. It steeps into a vivid pale lime colour and could be a perfect introduction to loose leaf green tea as it doesn’t have that bitter and somewhat vegetal taste that may have put you off before. If it weren’t green tea, it would probably be pink as the clean and rounded taste leaves you feeling light and alive while the flavour evolves into an enveloping aftertaste. Actually, this aftertaste is really refreshing and stays with you for a long time. It’s possible I like this as much as the initial taste! It’s a tea you can drink throughout the day, great in the afternoon but perhaps go easy in the evening, as there’s still some Theine/caffine in green tea! Tea ware has a rich history in China and it’s said that Fine China or Cast Iron teapots would suit green tea the best. Also if you simply rinse the teapot afterwards, you’ll build up more taste over time! Putting my cast iron teapot to use, I then tried the Organic ‘Dragon Well’ or ‘Long Jing Lu Cha’ from the Longzhuang Garden, Zhejiang Province. 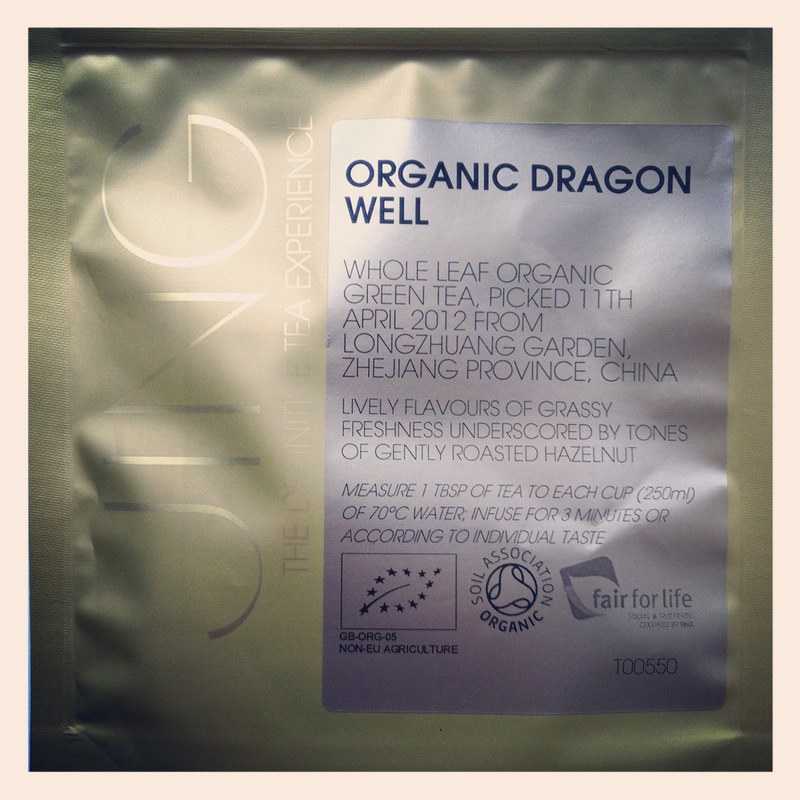 Plucked in April, this is one of the world’s finest green teas and the traditional method of making Dragon Well is what really sets it apart. Each individual tea bud is hand-pressed and shaped in a wok to achieve the perfect level of roasting. The leaves are big and flat and remind me of little mange-touts! Once brewed for around 3 minutes, there is a spring-fresh and fruity aroma. But don’t be fooled, this is a well-defined, grassy tea that makes no apologies! It has a creamier texture than the Jade Sword with hazelnut notes, which stays with you into the aftertaste. This tea is perfect any time of the day but I had to be careful with the steeping as I was getting close to bitter! I loved the smell but I’m not a huge nut fan and it left me feeling slightly dry as opposed to refreshed. However, there’s a great demand for orthodox dragon well and if you like a full, grassy green tea – and nuts - you’ll love this one. Jasmine Green Tea is the most popular scented tea in the world and the Jasmine Pearls is one of Jing’s bestsellers! Jing uses spring green tea from the Fujian region and rolls these tippy leaves into pearls before wrapping them in paper to keep their shape. They’re then scented in the summer with fresh Jasmine flowers five times! This must be a lengthy and delicate process and I’m pleased to be drinking it rather than making it that’s for sure! You’re consumed with Jasmine, the mystical seductress as soon as you take a whiff of these tea pearls. Once you infuse them for around 3 minutes, the pearls release an aroma, full and spring fresh alongside the sweet jasmine perfume, which has a hint of rose petal. There’s a rich and creamy texture with a taste that’s anything but subtle. Although you can’t ignore the Jasmine, it wouldn’t be her style to over- dominate so you can expect a respectful balance. It has a long aftertaste and I was surprised to find it fruity, like with a hint of orange maybe? You can re-steep up to 3 times and the caffeine might have taken effect if the jasmine didn’t leave you feeling serene. This is definitely my favourite type of green tea and possibly my favourite out of all teas. I wonder what men think of this scent, do they mind the perfumery? Aside from that I think this would be a good choice for someone who wants to ease carefully into green tea as the jasmine makes it so much more enticing. Have you tried a tea which is from India? I think you will love it too. I got my Indian tea called tulsi from Organic India but I'm still exploring for some great tea around the world. Can I ask where can I get this jing green tea or even those pearl tea? I've tried Darjeeling tea but hope to look more into India teas. If you look on JING's wesbite http://jingtea.com/delivery they are an online shop but deliver worldwide. If you go to teas at the top, you can find Jasmine Pearls in the Green tea section. They really are lovely! Happy exploring and let us know how you get on!